The laughing sounds loons make led to the term “crazy as a loon”. Loons have stout bodies, long necks, and pointed bills. Most of their time is spent afloat. The yellow-billed loon is black with white spots on its back and a light yellow bill. During the non-breeding season, is loses its black and white coloration and molts to a light brown color. It is the largest species of loon. Unlike most birds, loons have solid bones, and they compress the air out of their feathers to allow them to float lower in the water. Both of these adaptations make diving easier. Loons carry their bills parallel to the water unlike cormorants whose hooked bills are held at an angle. Mergansers have a crest and a narrower bill compared to loons. Grebes are shorter-bodied than loons. In flight, loons have a slower wing beat and low-slung heads and necks, distinguishing them from ducks. The yellow-billed loon can be distinguished from the red-throated, Pacific, and arctic loons by its larger body size and black head. The other three species are significantly smaller and have gray heads. It can be distinguished from the common loon mainly by its beak color. The pattern on its back is also different. The yellow-billed loon has large white spots while the common loon has a pattern of white stripes, spots, squares, and rectangles. Loons mate for life and return to the same area to breed year after year. In the spring, the adults leave the juveniles on the coast and arrive at their freshwater nesting grounds by late May. The make their nests at the shoreline by piling debris and rotting vegetation into a mound. Two eggs are laid in late May or June. The parents take turns sitting on the nest, and eggs hatch in about 1 month. The young leave the nest within a few days. During the first week of life, they will ride on their parents back to stay dry and warm. The parents feed the hatchlings which grow slowly. They typically learn to fly after about 3 months. Generally only 1 hatchling will survive to migrate in the fall. The birds mature in 2 years and spend their second summer on the coast. Loons feed mainly on small fish but also eat aquatic plants, insects, mollusks, and frogs. The main prey species for loons are ninespine stickleback, least cisco, Alaska blackfish, fourhorn sculpin, isopods, and amphipods. They feed in deep, open water and catch their food by diving. Loons are considered one of the best diving birds in the world. They can stay underwater over one minute. They propel themselves underwater with their feet and use their wings to steer. They have been caught in fishing nets 240 feet deep suggesting that these birds can reach significant depth during their dives. When frightened, loons generally prefer diving to taking flight. These large birds need considerable distance to take off. The largest sometimes require up to a quarter mile to get airborne. Once in the air, loons are very strong, reaching flight speeds up to 60 mph. When they come in to land, they slide on their breasts rather than their feet. Loons are very awkward on land. Highly specialized leg and pelvic structures to aid swimming makes walking very difficult. Therefore, they place their nests at the water’s edge and take flight from the water. On the summer nesting grounds, yellow-billed loons make a call that sounds like yodeling or crazy laughter. At night their call sounds more like a wail. Most of their calling is made during the summer breeding season, both day and night. They are fairly quiet during the winter. Yellow-billed loons migrate between their summer breeding grounds in the arctic tundra and their coastal wintering grounds to the south and east. They travel along the northern coast of Canada and the northern and northwestern coasts of Alaska. They undertake their spring migration in May and their fall migration in late August to mid-September. Yellow-billed loons generally migrate alone or in pairs. Sometimes they will be found in loose flocks. They are more likely to migrate in larger groups for the fall migration than the spring migration. Non-breeding individuals do not migrate. 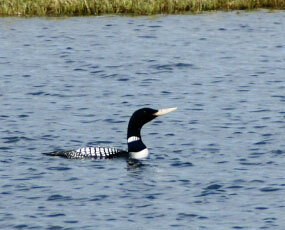 Yellow-billed loons are found throughout northwestern Canada, Alaska, and northeastern Eurasia. In Alaska, yellow-billed loons summer in the northern and western Alaskan tundra on freshwater lakes. During the winter, they are found in nearshore marine waters of southcoastal and southeastern Alaska. They are occasionally seen wintering in Homer, Cordova, or northern Southeast Alaska. The current status for yellow-billed loons in Alaska is “warranted but precluded,” making it a candidate species. 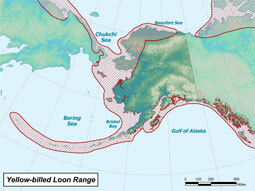 This indicates that it meets the criteria to be listed as threatened or endangered under the Endangered Species Act (ESA) but the proposal has been delayed due to higher priority cases. The global trend is thought to be stable. Within the state of Alaska, the population is stable or slightly declining. Breeding habitat loss or degradation, reduction of prey base due to overfishing, incidental mortality in fisheries, subsistence harvest, and predation are the main potential threats to yellow-billed loons. There is high chick mortality on some breeding grounds. This may be due to predation on chicks and eggs by gulls, jaegers, and foxes. There is also disturbance from float planes, boats, and fishermen that force adults off the nests leaving the eggs to freeze. Loons may become entangled and drown in fishing nets. The USFWS listed yellow-billed loons as a Candidate species under the Endangered Species Act in 2009 due to concerns that subsistence harvest of this species was unsustainable. Subsistence harvest surveys continue to be redesigned in an effort to more accurately estimate the numbers of yellow-billed loons taken annually.